This document provides a general overview of virtualization in RHEL 8: its basics, advantages, components, and other possible virtualization solutions provided by Red Hat. Red Hat Enterprise Linux 8 (RHEL 8) provides the virtualization functionality. This means that with the help of virtualization software, a machine running RHEL 8 can host multiple virtual machines (VMs), also referred to as guests. Guests use the host’s physical hardware and computing resources to run a separate, virtualized operating system as a user-space process on the host’s operating system. In other words, virtualization makes it possible to have operating systems within operating systems. For more information on what virtualization is, see the Red Hat Customer Portal. Virtual machines enable you to safely test software configurations and features, run legacy software, or optimize the workload efficiency of your hardware. For more information on the benefits , see Section 1.2, “Advantages of virtualization”. To try out virtualization in RHEL 8, see Chapter 2, Getting started with virtualization in RHEL 8. A virtual guest runs on a host machine, which is usually physical, and physical hardware can also be assigned for the guest to use. However, the allocation of physical resources to the guest is done in software, and is therefore very flexible. A guest uses a configurable fraction of the host memory, CPUs, or storage space, and that configuration can specify very fine-grained resource requests. For example, what the guest sees as its disk can be represented as a file on the host file system, and the size of that disk is much less constrained than the available sizes for physical disks. All of the guest’s configuration is saved as data on the host, and under software control. Therefore, a guest can easily be created, removed, cloned, migrated, operated remotely, or connected to remote storage. In addition, the current state of the guest can be backed up as a snapshot at any time. A snapshot can then be loaded to restore the system to the saved state. A guest runs on a virtualized kernel, separate from the host OS. This means that any OS can be installed on a guest, and that even if a guest becomes unstable or is compromised, the host is not affected in any way. Not all operating systems are supported as a guest OS in a RHEL 8 host. For details, see Section 6.2, “Recommended features in RHEL 8 virtualization”. A single physical machine can host a large number of virtual guests. Therefore, it avoids the need for multiple physical machines to do the same tasks, and thus lowers the space, power, and maintenance requirements associated with physical hardware. The basis of virtualization in RHEL 8 is the Kernel-based Virtual Machine (KVM) kernel module and virtualization kernel drivers, such as virtio and vfio. These components ensure that the Linux kernel on the host machine provides resources for virtualization to user-space software. At the user-space level, the QEMU emulator simulates a complete virtualized hardware platform that the guest operating system can run in, and manages how resources are allocated on the host and presented to the guest. In addition, the libvirt software suite serves as a management and communication layer, making QEMU easier to interact with, enforcing security rules, and providing a number of additional tools for configuring and running guests. As such, libvirt translates input from specialized virtualization tools, such as the virsh, virt-install, and guestfish commands or the Cockpit GUI, into instructions for QEMU. QEMU communicates the instructions to KVM, which ensures that the kernel appropriately assigns the resources necessary to carry out the instructions. As a result, QEMU can execute the corresponding user-space changes, such as creating or modifying a guest, or performing an action in the guest’s operating system. While QEMU is an essential component of the architecture, it is not intended to be used directly on RHEL 8 systems, due to security concerns. Therefore, using qemu-* commands is not supported by Red Hat, and it is highly recommended to interact with QEMU using libvirt. The following briefly describes the available methods of managing virtualization in Red Hat Enterprise Linux 8 (RHEL 8). For more information, see the virsh(1) man page. virt-install - A CLI utility for creating new virtual machines. For more information, see the virt-install(1) man page. virt-xml - A utility for editing the configuration of a virtual machine. guestfish - A utility for examining and modifying virtual machine disk images. For more information, see the guestfish(1) man page. For instructions on basic virtualization management with CLI, see Chapter 2, Getting started with virtualization in RHEL 8. The Cockpit web-based application provides a remotely accessible and easy to use graphical user interface for managing virtual machines and virtualization hosts. For instructions on basic virtualization management with Cockpit, see Chapter 3, Using Cockpit for managing virtual machines. The Virtual Machine Manager (virt-manager) application provides a specialized GUI for managing virtual machines and virtualization hosts. Although still supported in RHEL 8, virt-manager has been deprecated. Cockpit is intended to become its replacement in a subsequent release. It is, therefore, recommended that you get familiar with Cockpit for managing virtualization in a GUI. However, in RHEL 8, some features may only be accessible from either virt-manager or the command line. 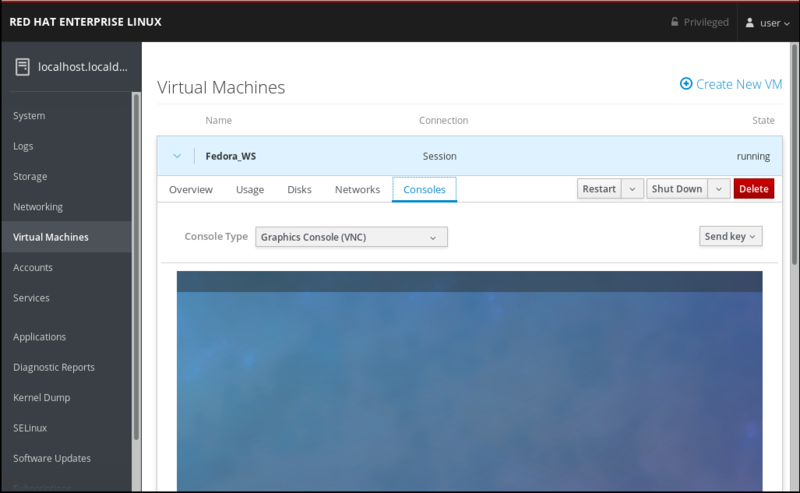 The Gnome Boxes application is a lightweight graphical interface to view and access virtual machines and remote systems. Gnome Boxes is primarily designed for use on desktop systems. 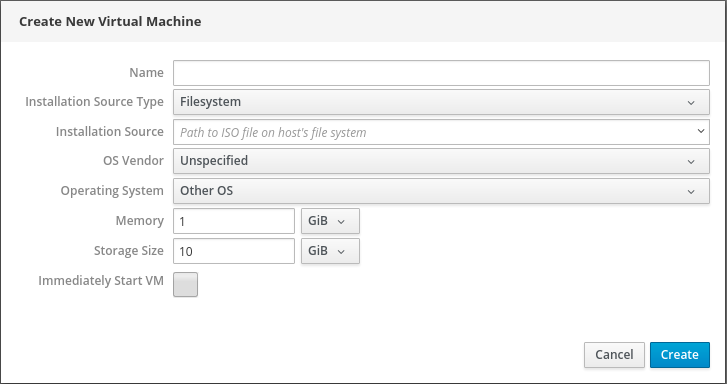 Gnome Boxes is provided as a part of the GNOME desktop environment and is supported on RHEL 8, but Red Hat recommends that you use Cockpit for managing virtualization in a GUI. RHV is designed for enterprise-class scalability and performance, and enables management of your entire virtual infrastructure, including hosts, virtual machines, networks, storage, and users from a centralized graphical interface. For information about the differences between virtualization in Red Hat Enterprise Linux and Red Hat Virtualization, see the Red Hat Customer Portal. Red Hat Virtualization can be used by enterprises running large deployments or mission-critical applications. Examples of large deployments suited to Red Hat Virtualization include databases, trading platforms, and messaging systems that must run continuously without any downtime. For more information about Red Hat Virtualization, see the Red Hat Customer Portal or the Red Hat Virtualization documentation suite. Red Hat OpenStack Platform offers an integrated foundation to create, deploy, and scale a secure and reliable public or private OpenStack cloud. For more information about Red Hat OpenStack Platform, see the Red Hat Customer Portal or the Red Hat OpenStack Platform documentation suite. Containers are isolated instances of the host OS and operate on top of an existing OS kernel. For more information on containers, see the Red Hat Customer Portal. To start using virtualization in RHEL 8, use the following steps. The default method for this is the command-line interface (CLI), but for user convenience, some of the steps can be completed in the Cockpit GUI. Enable the virtualization module and install the virtualization packages - see Section 2.1, “Enabling virtualization in RHEL 8”. For CLI, see Section 2.2.2, “Creating a guest virtual machine using the command-line interface”. For GUI, see Section 2.2.3, “Creating virtual machines using Cockpit”. For CLI, see Section 2.3.2, “Starting a guest virtual machine using the command-line interface”. For GUI, see Section 2.3.3, “Powering up virtual machines in Cockpit”. For CLI, see Section 2.4.2, “Connecting to a guest virtual machine using the command-line interface”. For GUI, see Section 2.4.3, “Viewing the graphical console in Cockpit”. Cockpit currently provides only a subset of guest management functions for virtual machines, so using the command line is recommended for advanced use of virtualization in RHEL 8. To use virtualization in RHEL 8, you must enable the virtualization module, install virtualization packages, and ensure your system is configured to host virtual machines. Red Hat Enterprise Linux 8 must be installed and registered on your host machine. The architecture of your host machine supports KVM virtualization. If all virt-host-validate checks return a PASS value, your system is prepared for creating virtual machines. If any of the checks return a FAIL value, follow the displayed instructions to fix the problem. If any of the checks return a WARN value, consider following the displayed instructions to improve virtualization capabilities. However, attempting to create virtual machines on such a host system will fail, rather than have performance problems. To create a virtual machine (VM) in RHEL 8, use the command line interface or the Cockpit GUI. Virtualization must be installed and enabled on your system. Prior to creating virtual machines (VMs) on your system, consider the amount of system resources you need to allocate to your VMs, such as disk space, RAM, or CPUs. The recommended values may vary significantly depending on the intended tasks and workload of the VMs. Optionally, a Kickstart file can also be provided for faster and easier configuration of the installation. The following creates a virtual machine named demo-guest1 that installs the Fedora 29 OS from an ISO image locally stored in the /home/username/Downloads/Fedora29.iso file. This guest is also allocated with 2048 MiB of RAM, 2 vCPUs, and a 8 GiB qcow2 virtual disk is automatically configured for the guest. The following creates a virtual machine named demo-guest2 that uses the /home/username/Downloads/Fedora29.iso image to run an OS from a live CD. No disk space is assigned to this guest, so changes made during the session will not be preserved. In addition, the guest is allocated with 4096 MiB of RAM and 4 vCPUs. The following creates a RHEL 8 virtual machine named demo-guest3 connects to an existing disk image, /home/username/backup/disk.qcow2. This is similar to physically moving a hard drive between machines, so the OS and data available to demo-guest3 are determined by how the image was handled previously. In addition, this guest is allocated with 2048 MiB of RAM and 2 vCPUs. Note that the --os-variant option is highly recommended when importing a disk image. If it is not provided, the performance of the created VM will be suboptimal. The following creates a virtual machine named demo-guest4 that installs from the http://example.com/OS-install URL. For the installation to start successfully, the URL must contain a working OS installation tree. In addition, the OS is automatically configured using the /home/username/ks.cfg kickstart file. This guest is also allocated with 2048 MiB of RAM, 2 vCPUs, and a 16 GiB qcow2 virtual disk. # virt-install --name demo-guest4 --memory 2048 --vcpus 2 --disk size=16 --os-variant fedora29 --location http://example.com/OS-install --initrd-inject /home/username/ks.cfg --extra-args="ks=file:/ks.cfg console=tty0 console=ttyS0,115200n8"
The following creates a virtual machine named demo-guest5 that installs from a RHEL8.iso file in text-only mode, without graphics. It connects the guest console to the serial console. The guest has 16384 MiB of memory, 16 vCPUs, and 280 GiB disk. This kind of installation is useful when connecting to a host over a slow network link. 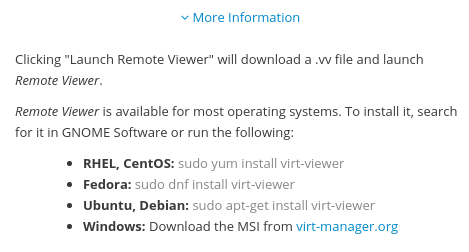 A number of other options can be specified for virt-install to further configure the guest and its OS installation. For details, see the virt-install man page. You can create virtual machines using Cockpit. Before using Cockpit to manage virtual machines, you must install the Cockpit virtual machine plug-in. If the Cockpit plug-in is not installed, see Section 3.2, “Setting up Cockpit to manage virtual machines” for information about installing the Cockpit virtual machine plug-in. You can create a virtual machine on the machine to which Cockpit is connected. The Create New Virtual Machine dialog appears. Enter the basic configuration of the virtual machine you want to create. Name - The name of the virtual machine. Installation Source - The path or URL that points to the installation source. OS Vendor - The vendor of the virtual machine’s operating system. Operating System - The virtual machine’s operating system. Memory - The amount of memory with which to configure the virtual machine. Storage Size - The amount of storage space with which to configure the virtual machine. Immediately Start VM - Whether or not the virtual machine will start immediately after it is created. The virtual machine is created and will start immediately if the Immediately Start VM checkbox is selected. You must install the operating system the first time the virtual machine is run. For information on installing an operating system on a virtual machine, see Section 3.3.2, “Installing operating systems using Cockpit”. To start an virtual machine in RHEL 8, you can use the command line interface or the Cockpit GUI. Before a VM can be started, it must be created and ideally also installed with an OS. For instruction to do so, see Section 2.2, “Creating virtual machines”. You can run a selected virtual machine. If a virtual machine is in the shut off state, you can start it. Click a row with the name of the virtual machine you want to start. 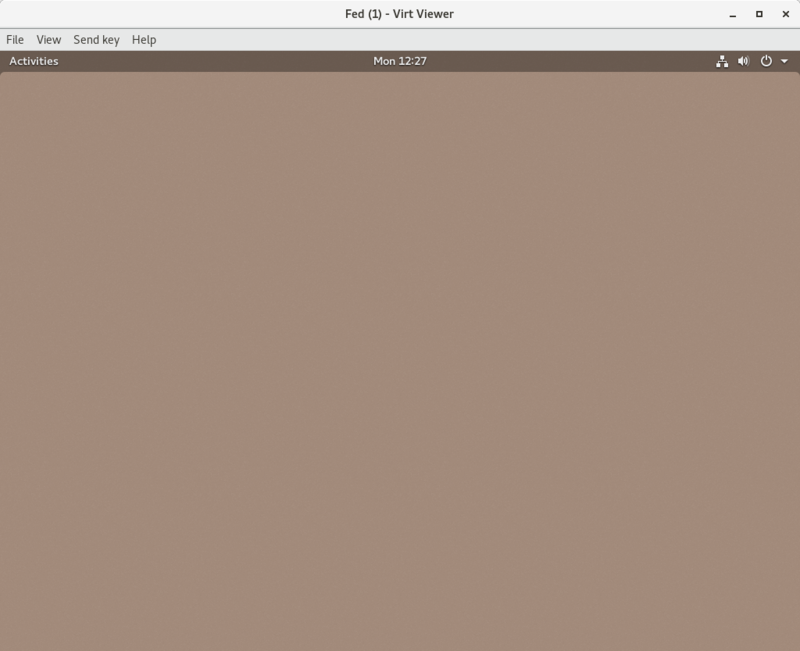 The row expands to reveal the Overview pane with basic information about the selected virtual machine and controls for shutting down and deleting the virtual machine. For information on shutting down a virtual machine, see Section 3.4.2, “Powering down virtual machines in Cockpit”. For information on restarting a virtual machine, see Section 3.4.3, “Restarting virtual machines using Cockpit”. For information on sending a non-maskable interrupt to a virtual machine, see Section 3.4.4, “Sending non-maskable interrupts to virtual machines using Cockpit”. To interact with the OS installed in a virtual machine (VM) running on a Red Hat Enterprise Linux 8 host, you need to connect to the VM. To do so, you can use the command line interface or the Cockpit GUI. You can view the graphical console of a selected virtual machine in Cockpit. The virtual machine console shows the graphical output of the virtual machine. Click a row with the name of the virtual machine whose graphical console you want to view. The graphical console appears in the Cockpit pane. You can interact with the virtual machine console using the mouse and keyboard in the same manner you interact with a real machine. The display in the virtual machine console reflects the activities being performed on the virtual machine. The server on which Cockpit is running can intercept specific key combinations preventing them from being sent to the virtual machine. To send such key combinations, click the Send key menu and select the key sequence to send. For example, to send the Ctrl+Alt+Del combination to the virtual machine, click on the Ctrl+Alt+Del menu entry. For details on viewing the graphical console in a remote viewer, see Section 3.9.2, “Viewing virtual machine consoles in remote viewers using Cockpit”. For details on viewing the serial console in Cockpit, see Section 3.9.3, “Viewing the virtual machine serial console in Cockpit”. To shut down a running virtual machine in Red Hat Enterprise Linux 8, use the command line interface or the Cockpit GUI. The virsh destroy command does not actually delete or remove the guest configuration or disk images. It only destroys the running guest instance. However, in rare cases, this command may cause corruption of the guest’s file system, so using virsh destroy is only recommended if all other shutdown methods have failed. You can shut down a selected virtual machine. If a virtual machine is in the running state, you can shut it down. Click a row with the name of the virtual machine you want to shut down. The virtual machine shuts down. If the virtual machine does not shut down, click the arrow next to the Shut Down button and select Force Shut Down. For information on starting a virtual machine, see Section 3.4.1, “Powering up virtual machines in Cockpit”. You can use the Cockpit interface to manage virtual machines. The following sections describe Cockpit’s virtualization management capabilities and provide instructions for using them. Cockpit is a web-based interface for administering servers. It provides a graphical view of the virtual machines on the servers to which Cockpit can connect, and allows monitoring system resources and adjusting configuration with ease. With the installation of a Cockpit plug-in, Cockpit can be used to manage virtual machines on the servers to which Cockpit can connect. In RHEL 8, Cockpit is the default graphical management tool for virtual machines, because the Virtual Machine Manager has been deprecated. However, the Virtual Machine Manager is still supported in RHEL 8. Ensure that Cockpit is installed on your machine. If the installation is successful, Virtual Machines appears in the Cockpit side menu. Using Cockpit, you can create virtual machines and install operating systems on virtual machines. You can also delete virtual machines. You can install an operating system on virtual machines using Cockpit. The first time a virtual machine loads, you must install an operating system on the virtual machine. The installation routine of the operating system runs in the virtual machine console. If the Immediately Start VM checkbox in the Create New Virtual Machine dialog is checked, the installation routine of the operating system starts automatically when the virtual machine is created. If the installation routine fails, the virtual machine must be deleted and recreated. You can delete virtual machines and their associated storage files. You can delete a virtual machine from the host to which Cockpit is connected. Click a row with the name of the virtual machine you want to delete. If you want to delete all or some of the storage files associated with the virtual machine, select the checkboxes next to the storage files you want to delete. The virtual machine and any selected associated storage files are deleted. Using Cockpit, you can run, shut down, and restart virtual machines. You can also send a non-maskable interrupt to a virtual machine that is unresponsive. You can restart a selected virtual machine. If a virtual machine is in the running state, you can restart it. Click a row with the name of the virtual machine you want to restart. The virtual machine shuts down and restarts. If the virtual machine does not restart, click the arrow next to the Restart button and select Force Restart. You can send a non-maskable interrupt (NMI) to a selected virtual machine that becomes unresponsive. If a virtual machine is in the running state but is unresponsive, you can send it an NMI. Click a row with the name of the virtual machine to which you want to send an NMI. Clickthe arrow next to the Shut Down button and select Send Non-Maskable Interrupt. An NMI is sent to the virtual machine. Using Cockpit, you can view information about the virtual machines to which Cockpit is connected. The following describes how to view state and connection information about the virtual machines to which the Cockpit session is connected. To view connection and state information for the virtual machines to which Cockpit is attached. Click Virtual Machines in the Cockpit side menu. Information about the virtual machines to which the Cockpit session is connected appears. Connection - The type of libvirt connection, system or session. State - The state of the virtual machine. For information on viewing basic information about a selected virtual machine to which the Cockpit session is connected, see Section 3.5.2, “Viewing basic virtual machine information in Cockpit”. For information on viewing resource usage for a selected virtual machine to which the Cockpit session is connected, see Section 3.5.3, “Viewing virtual machine resource usage in Cockpit”. For information on viewing disk information about a selected virtual machine to which the Cockpit session is connected, see Section 3.5.4, “Viewing virtual machine disk information in Cockpit”. For information on viewing virtual network interface card information about a selected virtual machine to which the Cockpit session is connected, see Section 3.5.5, “Viewing virtual NIC information in Cockpit”. The following describes how to view basic information about a selected virtual machine to which the Cockpit session is connected. To view basic information about a selected virtual machine. Click a row with the name of the virtual machine whose information you want to see. If another tab is selected, click Overview. Memory - The amount of memory assigned to the virtual machine. Emulated Machine - The machine type emulated by the virtual machine. vCPUs - The number of virtual CPUs configured for the virtual machine. To see more detailed virtual CPU information and configure the virtual CPUs configured for a virtual machine, see Section 3.6.1, “Configuring virtual CPUs for virtual machines using Cockpit”. Boot Order - The boot order configured for the virtual machine. CPU Type - The architecture of the virtual CPUs configured for the virtual machine. Autostart - Whether or not autostart is enabled for the virtual machine. For information on viewing information about all of the virtual machines to which the Cockpit session is connected, see Section 3.5.1, “Viewing virtual machine information in Cockpit”. The following describes how to view resource usage information about a selected virtual machine to which the Cockpit session is connected. To view information about the memory and virtual CPU usage of a selected virtual machine. The Usage pane appears with information about the memory and virtual CPU usage of the virtual machine. The following describes how to view disk information about a virtual machine to which the Cockpit session is connected. To view disk information about a selected virtual machine. The Disks pane appears with information about the disks assigned to the virtual machine. Device - The device type of the disk. Target - The controller type of the disk. Used - The amount of the disk that is used. Capacity - The size of the disk. Bus - The bus type of the disk. Readonly - Whether or not the disk is read-only. Source - The disk device or file. To view information about the virtual network interface cards (NICs) on a selected virtual machine. The Networks pane appears with information about the virtual NICs configured for the virtual machine. Type - The type of network interface for the virtual machine. Types include direct, network, bridge, ethernet, hostdev, mcast, user, and server. Model type - The model of the virtual NIC. MAC Address - The MAC address of the virtual NIC. Source - The source of the network interface. This is dependent on the network type. State - The state of the virtual NIC. Using Cockpit, you can manage the virtual CPUs configured for the virtual machines to which Cockpit is connected. You can view information about the virtual machines. You can also configure the virtual CPUs for virtual machines. You can configure the number of virtual CPUs and other virtual CPU parameters for a virtual machine using Cockpit. Click a row with the name of the virtual machine for which you want to view and configure virtual CPU parameters. The row expands to reveal the Overview pane with basic information about the selected virtual machine, including the number of virtual CPUs, and controls for shutting down and deleting the virtual machine. Click the number of vCPUs in the Overview pane. The vCPU Details dialog appears. Configure the virtual CPUs for the selected virtual machine. vCPU Count - Enter the number of virtual CPUs for the virtual machine. The vCPU count cannot be greater than the vCPU Maximum. vCPU Maximum - Enter the maximum number of virtual CPUs that can be configured for the virtual machine. Sockets - Select the number of sockets to expose to the virtual machine. Cores per socket - Select the number of cores for each socket to expose to the virtual machine. Threads per core - Select the number of threads for each core to expose to the virtual machine. The virtual CPUs for the virtual machine are configured. Changes to the virtual CPU settings only take effect after the virtual machine is stopped and restarted. Using Cockpit, you can manage the disks configured for the virtual machines to which Cockpit is connected. 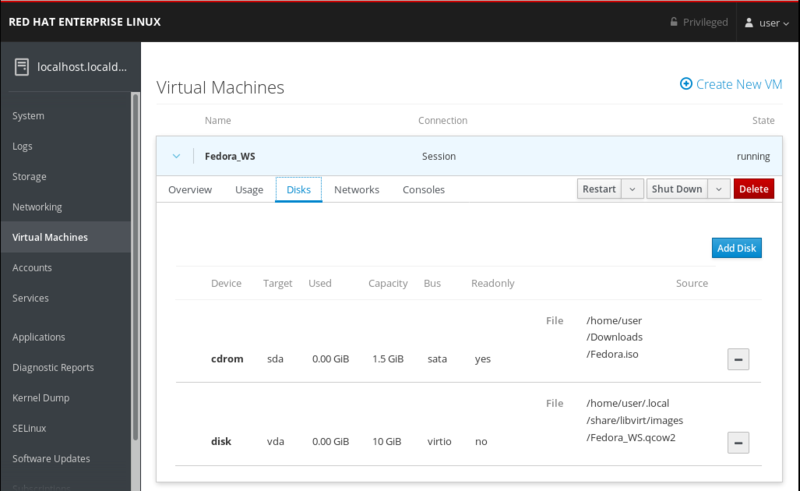 Create and attach new virtual disks to virtual machines. Attach existing virtual disks to virtual machines. Detach virtual disks from virtual machines. You can add new disks to virtual machines by creating a new disk (storage pool) and attaching it to a virtual machine using Cockpit. 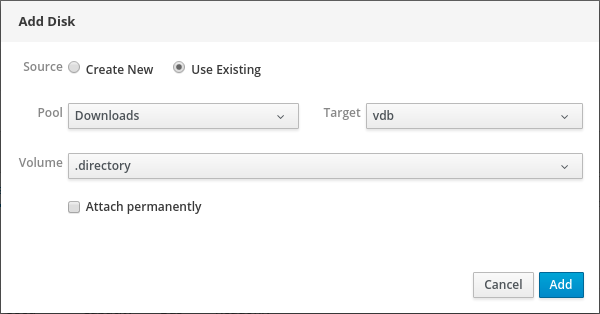 You can only use directory-type storage pools when creating new disks for virtual machines using Cockpit. Click a row with the name of the virtual machine for which you want to create and attach a new disk. The Disks pane appears with information about the disks configured for the virtual machine. The Add Disk dialog appears. Ensure that the Create New option button is selected. Pool - Select the storage pool from which the virtual disk will be created. Target - Select a target for the virtual disk that will be created. Name - Enter a name for the virtual disk that will be created. Size - Enter the size and select the unit (MiB or GiB) of the virtual disk that will be created. Attach permanently - Whether or not the virtual disk will be persistent. If checked, the virtual disk is persistent. If not checked, the virtual disk is not persistent. When adding a new disk to a virtual machine that is not running, the Attach permanently check box does not appear. Only persistent virtual disks can be added to virtual machines that are not running. The virtual disk is created and connected to the virtual machine. For information on viewing disk information about a selected virtual machine to which the Cockpit session is connected, see Section 3.7.1, “Viewing virtual machine disk information in Cockpit”. For information on attaching existing disks to virtual machines, see Section 3.7.3, “Attaching existing disks to virtual machines using Cockpit”. For information on detaching disks from virtual machines, see Section 3.7.4, “Detaching disks from virtual machines”. The following describes how to attach existing disks to a virtual machine using Cockpit. You can only attach directory-type storage pools to virtual machines using Cockpit. Click a row with the name of the virtual machine to which you want to attach an existing disk. Click the Use Existing option button. The appropriate configuration fields appear in the Add Disk dialog. Configure the disk for the virtual machine. Pool - Select the storage pool from which the virtual disk will be attached. Target - Select a target for the virtual disk that will be attached. Volume - Select the storage volume that will be attached. Attach Permanently - Check to make the virtual disk persistent. Clear to make the virtual disk transient. The selected virtual disk is attached to the virtual machine. For information on creating new disks and attaching them to virtual machines, see Section 3.7.2, “Adding new disks to virtual machines using Cockpit”. The following describes how to detach disks from virtual machines using Cockpit. Click a row with the name of the virtual machine from which you want to detach an existing disk. Click next to the disk you want to detach from the virtual machine. The virtual disk is detached from the virtual machine. There is no confirmation before detaching the disk from the virtual machine. Using Cockpit, you can manage the virtual network interface cards (vNICs) configured for the virtual machines to which Cockpit is connected. You can view information about vNICs. 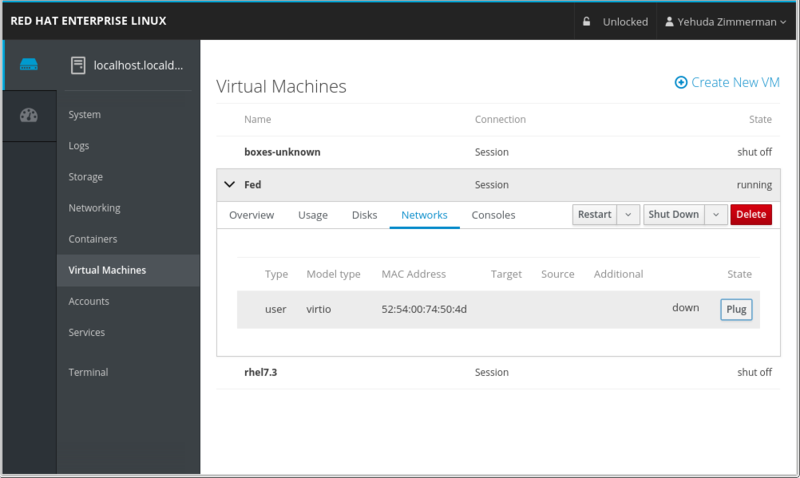 You can also connect and disconnect vNICs from virtual machines. Using Cockpit, you can connect virtual network interface cards (NICs) configured for a selected virtual machine. If a virtual NIC is disconnected from the selected virtual machine, you can reconnect it. Click a row with the name of the virtual machine whose virtual NIC you want to connect. Click Plug in the row of the virtual NIC you want to connect. The selected virtual NIC connects to the virtual machine. Using Cockpit, you can disconnect the virtual network interface cards (NICs) configured for a selected virtual machine. If a virtual NIC is connected to the selected virtual machine, you can disconnect it. Click a row with the name of the virtual machine whose virtual NIC you want to disconnect. Click Unplug in the row of the virtual NIC you want to disconnect. The selected virtual NIC disconnects from the virtual machine. Using Cockpit, you can view the virtual machine’s consoles. These include both graphical and serial consoles. The server on which Cockpit is running can intercept specific key combinations preventing them from being sent to the virtual machine. To send the Ctrl+Alt+Del combination to the virtual machine, click Ctrl+Alt+Del. From the virtual machine pane, click the Send key menu and select the key sequence to send. You can view the virtual machine’s consoles in a remote viewer. The connection can be made by Cockpit or manually. You can view the graphical console of a selected virtual machine in a remote viewer. The virtual machine console shows the graphical output of the virtual machine. You can launch Virt Viewer from within Cockpit. Before you can view the graphical console in Virt Viewer, Virt Viewer must be installed on the machine to which Cockpit is connected. To view information on installing Virt Viewer, select the Graphics Console in Desktop Viewer Console Type and click More Information in the Consoles window. Some browser extensions and plug-ins do not allow Cockpit to open Virt Viewer. The graphical console appears in the Cockpit window. Select the Graphics Console in Desktop Viewer Console Type. The graphical console appears in Virt Viewer. The server on which Cockpit is running can intercept specific key combinations (for example, Ctrl+Alt+F1) to prevent them from being sent to the virtual machine. You can use the menu:Send key menu to send these sequences. From the virtual machine window, click the menu:Send key menu and select the key sequence to send. In addition, from this menu you can also capture the screen output. For details on viewing the graphical console in a remote viewer using a manual connection, see Section 3.9.2.2, “Viewing the graphical console in a remote viewer connecting manually”. For details on viewing the graphical console in Cockpit, see Section 3.9.1, “Viewing the virtual machine graphical console in Cockpit”. Cockpit provides the information necessary to launch any SPICE or VNC viewer to view the virtual machine console. Before you can view the graphical console in a remote viewer, ensure that a SPICE or VNC viewer application is installed on the machine to which Cockpit is connected. To view information on installing Virt Viewer, select the Graphics Console in Desktop Viewer Console Type and click More Information in the Consoles window. You can view the virtual machine graphics console in any SPICE or VNC viewer application. The following Manual Connection information appears on the right side of the pane. Enter the information in the SPICE or VNC viewer. 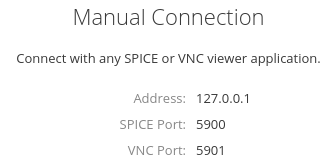 For more information, see the documentation for the SPICE or VNC viewer. For details onviewing the graphical console in a remote viewer using Cockpit to make the connection, see Section 3.9.2.1, “Viewing the graphical console in a remote viewer”. You can view the serial console of a selected virtual machine in Cockpit. Click a row with the name of the virtual machine whose serial console you want to view. Select the Serial Console Console Type. The serial console appears in the Cockpit pane. 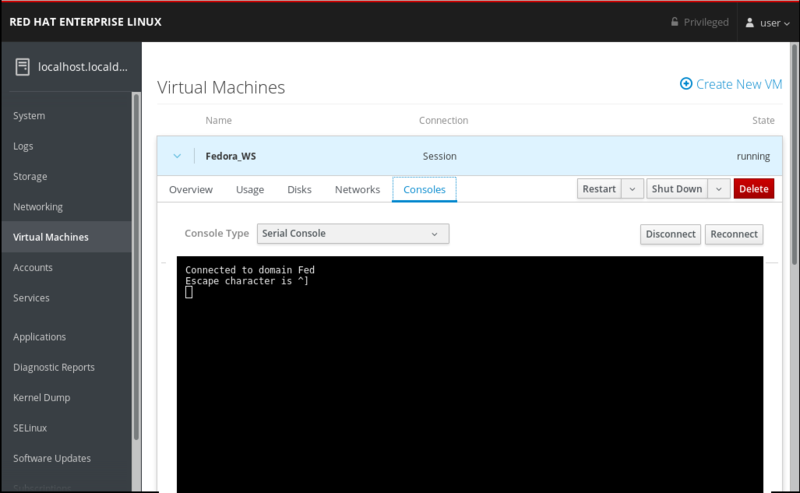 You can disconnect and reconnect the serial console from the virtual machine. To disconnect the serial console from the virtual machine, click Disconnect. To reconnect the serial console to the virtual machine, click Reconnect. Snapshots are files that can contain the disk image and memory state of a virtual machine. You can create a snapshot from any virtual machine on the host. The snapshot metadata can be supplied in an XML file or on the command line. You can also create a snapshot by cloning an existing snapshot. Internal snapshots are contained completely within a qcow2 file and are fully supported by libvirt, allowing for creating, deleting, and reverting of snapshots. This is the default setting used by libvirt when creating a snapshot, especially when no option is specified. This file type take slightly longer than others for creating the snapshot. In addition, internal snapshots require qcow2 disks. Internal snapshots are not being actively developed, and Red Hat discourages their use. External snapshots work with any type of original disk image, can be taken with no virtual machine downtime, and are more stable and reliable. As such, external snapshots are recommended for use on KVM guest virtual machines. However, external snapshots are currently not fully implemented. A workaround is described on libvirt upstream pages. Red Hat Enterprise Linux 8 only supports creating snapshots while the guest virtual machine is paused or powered down. Creating snapshots of running guests (also known as live snapshots) is available on Red Hat Virtualization. For details, call your service representative. You can create snapshots using XML files that contain the metadata for the snapshots. For information about the XML format for snapshot metadata, see the libvirt upstream website. The virsh snapshot-create command creates a snapshot for the specified virtual machine with the snapshot metadata in a named XML file. The command can use the virtual machine name, id, or uid to specify the virtual machine. The named XML file contains the snapshot metadata. The snapshot name, description, and disks elements must be specified in the XML file. Create an XML file with the virtual machine snapshot metadata. Using the virsh snapshot-dumpxml command to output the metadata of the current snapshot to an XML file. You can edit the file, if necessary. Using the virsh snapshot-create-as command with the print-xml option to output the metadata of a specified snapshot to an XML file. You can edit the file, if necessary. Run the virsh snapshot-create command. The virtual machine snapshot is created from the specified virtual machine using the metadata in the specified XML file. For information about the available options for the virsh create-snapshot command, see the relevant man page. You can create snapshots ​by entering the metadata for the snapshots as options on the command line. The virsh snapshot-create-as command creates a snapshot for the specified virtual machine with the snapshot metadata specified in the command options. The command can use the virtual machine name, id, or uid to specify the virtual machine. Run the virsh snapshot-create-as command. The virtual machine snapshot is created from the specified virtual machine using the metadata in the command options. The print-xml option can be used to display the snapshot XML based on the virsh snapshot-create-as command. For information about the available options for the virsh create-snapshot-as command, see the relevant man page. You can clone existing snapshots. The virsh snapshot-edit --clone command clones a specified snapshot for the specified virtual machine. The command can use the virtual machine name, id, or uid to specify the virtual machine. Run the virsh snapshot-edit --clone command. The specified virtual machine snapshot XML file opens in the default text editor. For example, vi. Edit the virtual machine snapshot XML file. Ensure that you change the value of the name field. Save the edited virtual machine snapshot XML file. Snapshot Snapshot1 cloned to Snapshot2. For a full description of all virsh snapshot-edit options, refer to the virsh snapshot-edit man page. The connection of virtual machines to other devices and locations on a network has to be facilitated by the host hardware. Virtual networking uses the concept of a virtual network switch. A virtual network switch is a software construct that operates on a host physical machine server. Virtual machines (guests) connect to the network through the virtual network switch. From the perspective of a guest operating system, a virtual network connection is the same as a physical network connection. Host physical machine servers view virtual network switches as network interfaces. When the libvirtd daemon (libvirtd) is first installed and started, the default network interface representing the virtual network switch is virbr0. This interface can be viewed with the ip command like any other network interface. Both inbound and outbound traffic is possible, but is affected by the firewalls in the guest operating system’s network stack and by libvirt network filtering rules attached to the guest interface. Only outbound traffic is possible and is affected by Network Address Translation (NAT) rules, as well as the host system’s firewall. For more information on the default configuration, see Section 5.6, “Virtual networking default configuration”. 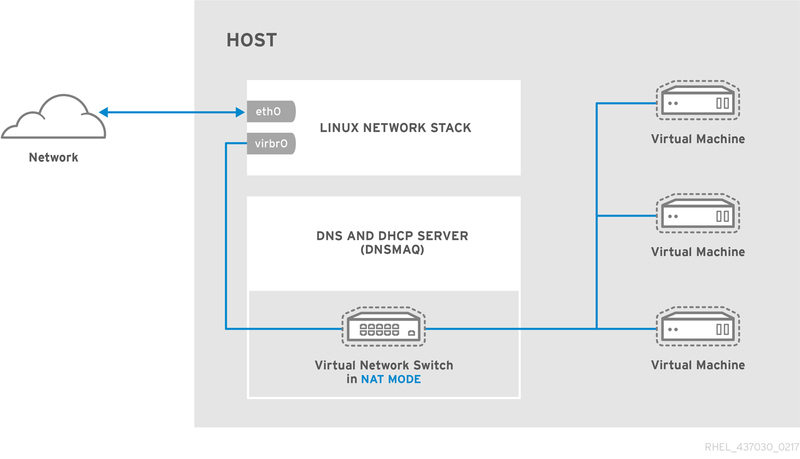 The virtual network uses network address translation (NAT) to assign IP address ranges to virtual networks and dnsmasq to automatically assign IP addresses to virtual machine network interface cards (NICs) and connect to a domain name service (DNS). When using Routed mode, the virtual switch connects to the physical LAN connected to the host physical machine, passing traffic back and forth without the use of NAT. The virtual switch can examine all traffic and use the information contained within the network packets to make routing decisions. When using this mode, all of the virtual machines are in their own subnet, routed through a virtual switch. This enables incoming connections, but requires extra routing-table entries for systems on the external network. Routed mode operates at Layer 3 of the OSI networking model. You can create a network where one or more nodes are placed in a controlled sub-network for security reasons. Such a sub-network is known as a demilitarized zone (DMZ). Host physical machines in a DMZ typically provide services to WAN (external) host physical machines as well as LAN (internal) host physical machines. Since this requires them to be accessible from multiple locations, and considering that these locations are controlled and operated in different ways based on their security and trust level, routed mode is the best configuration for this environment. A virtual server hosting provider may have several host physical machines, each with two physical network connections. One interface is used for management and accounting, the other is for the virtual machines to connect through. Each virtual machine has its own public IP address, but the host physical machines use private IP addresses so that management of the virtual machines can only be performed by internal administrators. When using Bridged mode, guests are connected to a bridge device that is also connected directly to a physical ethernet device connected to the local ethernet. As a result, the guest directly visible on the physical network. This enables incoming connections, but does not require any extra routing-table entries. 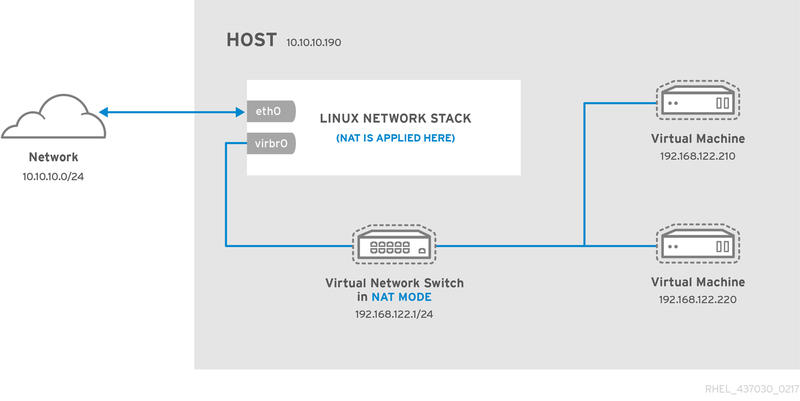 For basic outbound-only network access from virtual machines, no additional network setup is usually needed, because the default network is installed along with the libvirt package, and automatically started when the libvirtd service is started. If more advanced functionality is needed, additional networks can be created and configured using virsh, and the guest XML configuration file can be edited to use one of these new networks. All of the guest virtual machines appear within the same subnet as the host physical machine. All other physical machines on the same physical network are aware of the virtual machines, and can access them. Bridging operates on Layer 2 of the OSI networking model. It is possible to use multiple physical interfaces on the hypervisor by joining them together with a bond. The bond is then added to a bridge and then guest virtual machines are added onto the bridge as well. However, the bonding driver has several modes of operation, and only a few of these modes work with a bridge where virtual guest machines are in use. When using bridged mode, the only bonding modes that should be used with a guest virtual machine are Mode 1, Mode 2, and Mode 4. Using modes 0, 3, 5, or 6 is likely to cause the connection to fail. Also note that Media-Independent Interface (MII) monitoring should be used to monitor bonding modes, as Address Resolution Protocol (ARP) monitoring does not work. Deploying guest virtual machines in an existing network alongside host physical machines, making the difference between virtual and physical machines transparent to the end user. Deploying guest virtual machines that must be easily accessible to an existing physical network. Placing guest virtual machines on a physical network where they must access services within an existing broadcast domain, such as DHCP. For a detailed explanation of bridge_opts parameters, used to configure bridged networking mode, see the Red Hat Virtualization Administration Guide. When using Isolated mode, guests connected to the virtual switch can communicate with each other, and with the host physical machine, but their traffic will not pass outside of the host physical machine, and they cannot receive traffic from outside the host physical machine. Using dnsmasq in this mode is required for basic functionality such as DHCP. However, even if this network is isolated from any physical network, DNS names are still resolved. Therefore, a situation can arise when DNS names resolve but ICMP echo request (ping) commands fail. By default, virtual network switches operate in NAT mode. They use IP masquerading rather than Source-NAT (SNAT) or Destination-NAT (DNAT). IP masquerading enables connected guests to use the host physical machine IP address for communication to any external network. By default, computers that are placed externally to the host physical machine cannot communicate to the guests inside when the virtual network switch is operating in NAT mode. Virtual network switches use NAT configured by iptables rules. Editing these rules while the switch is running is not recommended, because incorrect rules may result in the switch being unable to communicate. The libvirt package includes dnsmasq to provide a Dynamic Host Configuration Protocol (DHCP) server and a Domain Name System (DNS) forwarder for virtual networks. The dnsmasq DHCP service can assign a pool of addresses to a virtual network switch. IP information can be assigned to virtual machines via DHCP. dnsmasq accepts DNS queries from virtual machines on the virtual network and forwards them to a real DNS server. An instance of dnsmasq is automatically configured and started by libvirt for each virtual network switch that needs it. A virtual network can be restricted to a specific physical interface. This may be useful on a physical system that has several interfaces (for example, eth0, eth1, and eth2). This is only useful in routed and NAT modes, and can be defined in the dev=<interface> option, or in Cockpit when creating a new virtual network. This document provides information on feature support and restrictions in Red Hat Enterprise Linux 8 (RHEL 8) virtualization. No actual support for RHEL 8 features is provided until it becomes globally available. For the Alpha and Beta stages, the following speaks about the planned scope of support for virtualization, and is subject to change. 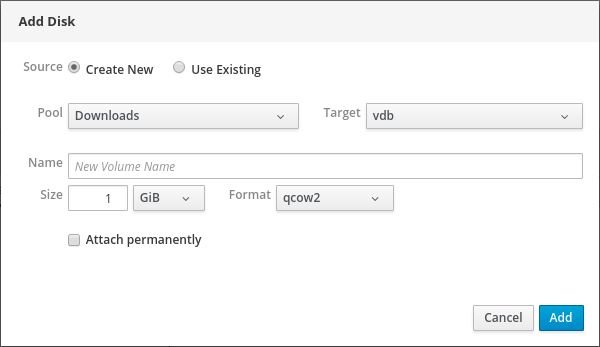 A set of support limitations applies to virtualization in Red Hat Enterprise Linux 8 (RHEL 8). This means that when you use certain features or exceed a certain amount of allocated resources when using virtual machines in RHEL 8, Red Hat will not support these guests unless you have a specific subscription plan. Features listed in Section 6.2, “Recommended features in RHEL 8 virtualization” have been tested and certified by Red Hat to work with the KVM hypervisor on a RHEL 8 system. Therefore, they are fully supported and recommended for use in virtualization in RHEL 8. Features listed in Section 6.3, “Unsupported features in RHEL 8 virtualization” may work, but are not supported and not intended for use in RHEL 8. 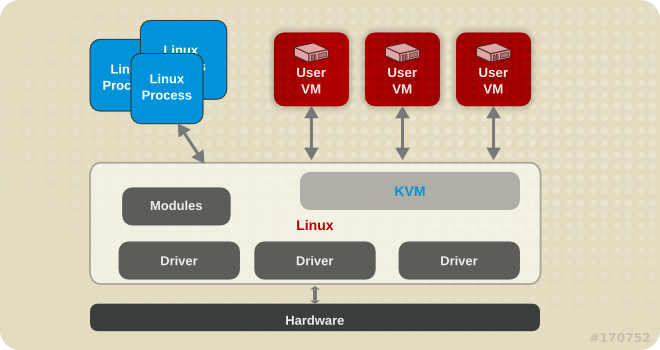 Therefore, Red Hat strongly recommends not using these features in RHEL 8 with KVM. Section 6.4, “Resource allocation limits in RHEL 8 virtualization” lists the maximum amount of specific resources supported on a KVM guest in RHEL 8. Guests that exceed these limits are not supported by Red Hat. In addition, unless stated otherwise, all features and solutions used by the documentation for RHEL 8 virtualization are supported. However, some of these have not been completely tested and therefore may not be fully optimized. Many of these limitations do not apply to other virtualization solutions provided by Red Hat, such as Red Hat Virtualization (RHV) or Red Hat OpenStack Platform (RHOSP). Currently, RHEL 8 documentation primarily describes AMD64 and Intel 64 features and usage. The recommended machine type for KVM guest virtual machines is QEMU Q35, which emulates the ICH9 chipset. For information about unsupported guest OS types and features in RHEL 8 virtualization, see Section 6.3, “Unsupported features in RHEL 8 virtualization”. For information about the maximum supported amounts of resources that can be allocated to a virtual machine, see Section 6.4, “Resource allocation limits in RHEL 8 virtualization”. Removing a virtual CPU (vCPU) from a running KVM virtual machine, also referred to as a vCPU hot unplug, is unsupported in RHEL 8 and using it may lead to VM crashes. Therefore, Red Hat strongly advises against its use. Decreasing the memory limit allocated to running a KVM virtual machine, also referred to as a memory hot unplug, is unsupported in RHEL 8 and using it may lead to VM crashes. Therefore, Red Hat strongly advises against its use. Configuring maximum input and output levels for operations on virtual disk, also known as I/O throttling, is not supported in RHEL 8. Migrating a disk image of a running virtual machine between hosts is not supported in RHEL 8. Creating or loading a snapshot of a running virtual machine, also referred to as a live snapshot, is not supported in RHEL 8. Suspending a virtual machine to the Suspend to RAM (S3) or Suspend to disk (S4) system power states is not supported. Note that these features are disabled by default, and enabling them will make your virtual machine not supportable by Red Hat. For information about supported guest OS types and recommended features in RHEL 8 virtualization, see Section 6.2, “Recommended features in RHEL 8 virtualization”. The following limits apply to virtualized resources that can be allocated to a single guest virtual machine on a Red Hat Enterprise Linux 8 (RHEL 8) host. A single RHEL 8 host supports up to 4 guests running at the same time. RHEL 8 supports up to 240 vCPUs allocated to a single KVM guest. RHEL 8 supports 32 PCI device slots per virtual machine bus, and 8 PCI functions per device slot. This gives a theoretical maximum of 256 PCI functions per bus when multi-function capabilities are enabled in the virtual machine, and no PCI bridges are used. Each PCI bridge adds a new bus, potentially enabling another 256 device addresses. However, some buses do not make all 256 device addresses available for the user; for example, the root bus has several built-in devices occupying slots. KVM is limited to a maximum of 4 virtualized IDE devices per virtual machine.